Eight Fractured Folk Songs for Voice and Piano (2004-2005) blends the talents of composer/singer/poet Joseph Zitt with those of composer/pianist/music theorist Katherine Setar. The songs are, in effect, acoustic remixes of existing folk or public domain songs which were inspired by such diverse influences as contemporary mash-up recordings, John Cale’s reworking of “Heartbreak Hotel,” Karlheinz Stockhausen’s electronic and acoustic “moment form” works, and the “Deep Listening” work of Pauline Oliveros. Setar and Zitt have created a different method of improvising for each song, starting with its text and musical elements and creating new musical languages that bring out its most emotionally involving and musically intriguing elements. Eight Fractured Folk Songs for Voice and Piano explores a wide range of both musical methodologies and emotional ranges. Among the many settings of songs, Zitt and Setar have also included “Black is the Color of my True Love’s Hair,” a folk song also set by composer Luciano Berio for his wife, Cathy Berberian. I explain what we’re doing with each song in Intro tracks between the songs. 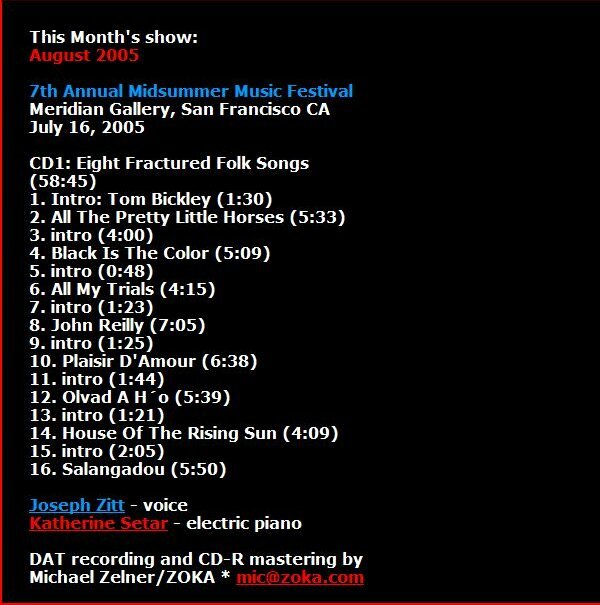 This is a live performance from July 16, 2005, presented at the 7th Annual Midsummer Music Festival, curated by Tom Bickley, at the Meridian Gallery in San Francisco, CA. Michael Zelner/ZOKA recorded and mastered the performance. It’s taken me a long time to post these, since, as happens with live recordings, all I could hear were my mistakes. (While Katherine’s playing is impeccable, there are times when, as my father used to say, my reach exceeded my grasp.) But at this remove, I find that I quite like them, and they present some of the more accessible recordings of my vocal work and our connections of composition and improvisation.